Our facility is centrally located in Cuyahoga County at the I-77 and I-480 interchange, only minutes from downtown and Cleveland Hopkin's airport. 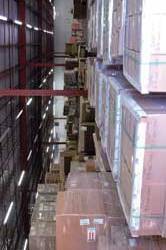 We have over 54,000 square feet of storage and 13 working docks. The ability to store pallets, bulk items, small parts, etc. Top Dawg is licensed to carry beer and wine products. Secure facility with cameras inside and out.